This deal was posted 7 months ago but i just clicked on it on the off chance as i wanted one and same offer as last deal. £74 off and Good reviews. I just ordered it standard delivery is £8.95 or named delivery £14.95 plus 7% Quidco. 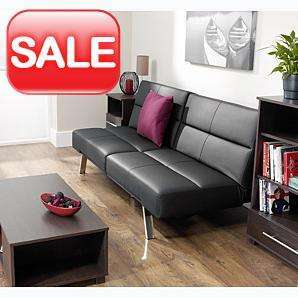 The Click Clack Sofa bed is a modern elegant multi position sofa bed. It is upholstered in faux leather and converts effortlessly into bed by simply clicking the back. Faux leather.......even with a sheet on this you'd be sweating like a maniac! No thanks, awful looking thing. I've got 2 of these. Overall I would rate them 7 out of 10. Pretty cool for basic but not very comfy. As a sofa it 'looks' fairly modern. As a bed... sooooooooooooooo uncomfortable. If style over comfort is your thing then fine but don't expect to be able to actually sleep on this thing.